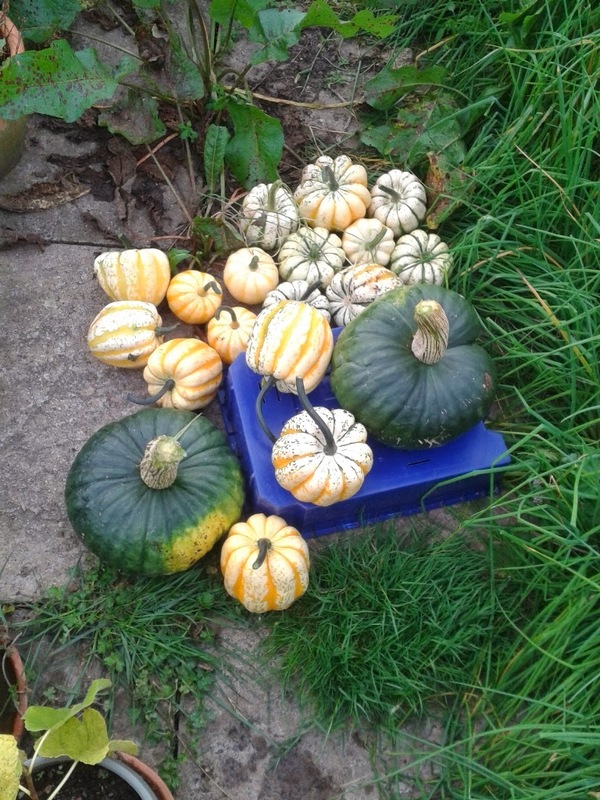 Our squash are nearly done as well, and not such a big harvest as we thought we would have either. Not to worry, some squash is better than none! But hey! Our squash are the bog standard looking type, but yours look really fancy dancy! I used to grow butternut as well but they didn't come through this year. I find their taste isn't as good as some of the others and I prefer the ones that look a little fancy! Him Outside had a rough count of butternuts and thinks there are about 130! We had quite a lot of plants, 3 or 4 dozen, I can't remember. But we just plant them out on the field and leave them to get on with it, and it was very dry here for months. We will sell them for £1 each - very handy income! We didn't have that good of year though we had a few butternut. The bugs seem to be bothering winter squash now where they used to only go after summer varieties. Even pumpkins did little. We had a real wet and cool summer so that may have had something to do with it. I fixed butternut soup last night. I grew green courgettes, didn't get off to a good start as the wood pigeons kept pulling out the seeds from the pots! I also grew 'patty pan white' only because the seeds where free...had lots of fruit from them, they are not very exciting in the flavour department. I plan to grow the traditional pumpkins ( only 1 - 2 plants because of space) and butternut squash as I love them roasted and in roasted BN soup. Try crown prince and turks turban as well they're tastey ones. As for courgettes we had so many ven the chickens got fed up of them! Toms and butternuts but not as many as I hoped there would be. Too many apples but I've been giving them away. Yeah my toms weren't that great, yet my mums plants looked worse than mine and somehow produced more! I don't have enough room for them sadly, I did try some courgettes in large pots but total failure ! I love your picture, it could have come straight from a gardening book ! I would frame it and hang it in the kitchen for inspiration for next year. I must try to grow a greater variety next year for a better photo. I always love gathering them in and seeing how many we've got! Hi, I'm over from the lovely John Grey's Blog... I've never grown squash; did have wonderful courgettes three years ago & this year I was given three tomato plants & I have loved the harvest - still going strong and outside all summer ! Reading through your older posts, I was really surprised to see you could eat Nasturtium seeds ! I knew about the flowers but not the seeds ! Yeah the nasturtium is a good plant to grow - you can eat the leaves as well. Courgettes are always a good one to grow as a couple of plants will give you more than you'll want to eat!